Have you noticed that police shootings are commonplace? I mean for people like you and me, with brown faces. and anger and despair on the faces of her husband, her sons. And then try to block out the voice yelling back, “Black girl, for you, there is none”. And after all these years, it’s still the same old American story. It’s horrific. It’s brutal. It’s bloody. This American story, so full of racism, hatred, and violence. Please don’t caution me to keep the peace when all you want me to do is keep silent. And that story you keep trying to sell me about equal opportunity, I just don’t buy it. You’re not the one out here everyday trying to prove your life has value. How many chokeholds will there be before you’re haunted by the voice of Eric Garner’s “I Can’t Breathe”? How many times will standing your ground mean killing another Trayvon Martins for being guilty of carrying skittles and iced tea? How many Renisha McBrides will knock on a white man’s door and get a shotgun to the head? How many Rekia Boyds, just chilling at the park will be shot dead? How many Oscar Grants will be shot while face down, hands cuffed behind his back? 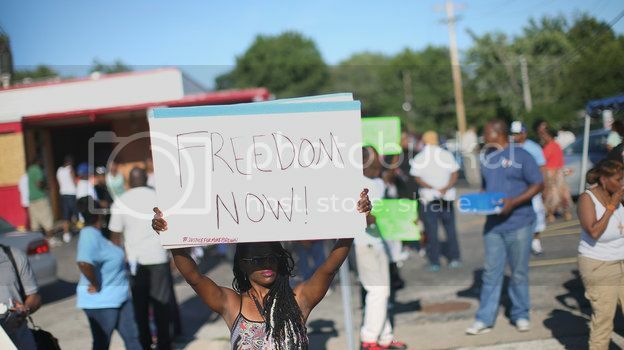 How many Michael Browns with their “Hands up, Don’t Shoot” will still be viciously attacked? How many Tarika Wilsons will be killed while holding their one-year-old son? How many 7-year-old Aiyana Jones will be killed before her life has even begun? I may not know all of their names but I can still see the bloodstained concrete. When all that protecting and serving you’re doing don’t include me? And then you look at Ferguson and wonder why the protests, why the unrest? But how long did you think you could step on the necks of oppressed people before they would fight back? Is it me, or is 2014 looking more and more like 1960? And sometimes I sit in my room wondering if God is really listening. Then what the f**k are you doing? The world won’t get no better, we gotta change it - yeah you and me. J Frederika is a preacher, poet, and change agent fighting to positively impact her community. You can find her on Twitter @ijustbelieve1.